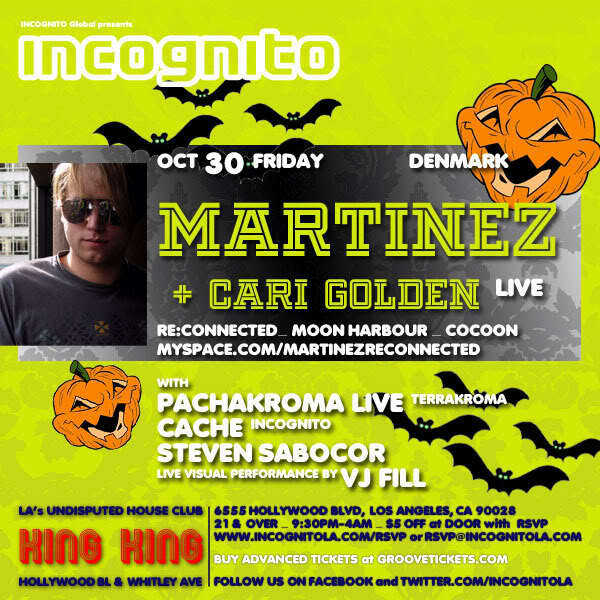 On Friday, October 30, INCOGNITO Global proudly presents the 1st LA Appearance of MARTINEZ (Re:Connected, Moon Harbor, Cocoon, Denmark). MARTINEZ is signed up to Steve Bug’s two labels, Dessous Recordings & Audiomatique, Get Physical, and currently, has been coming out with huge releases on Matthias Tanzmann’s Moon Harbour, Cocoon and his own label Re:Connected. In fact, he has received massive support from such DJ’s like Richie Hawtin, Ricaro Villalobos, Sven Vath, Loco Dice, Miss Kittin among others and has played together with DJs like Michael Mayer, Miss Kittin, Guido Schneider, Onur Ozer, Loco Dice & Sven Vath in clubs like Weetamix in Geneva, Amnesia & Space in Ibiza, Fabric in London, Cocoon in Frankfurt and Panorama Bar in Berlin to name a few. Support is coming from Birthday celebrant, CARI GOLDEN Live! with INCOGNITO’s CACHE on the decks. Bookending the night are PACHAKROMA Live! for the 1st time at King King and the debut of STEVE SABOCOR. This entry was posted on Saturday, October 31st, 2009 at 12:32 am	and is filed under Gigs. You can follow any responses to this entry through the RSS 2.0 feed. Responses are currently closed, but you can trackback from your own site.